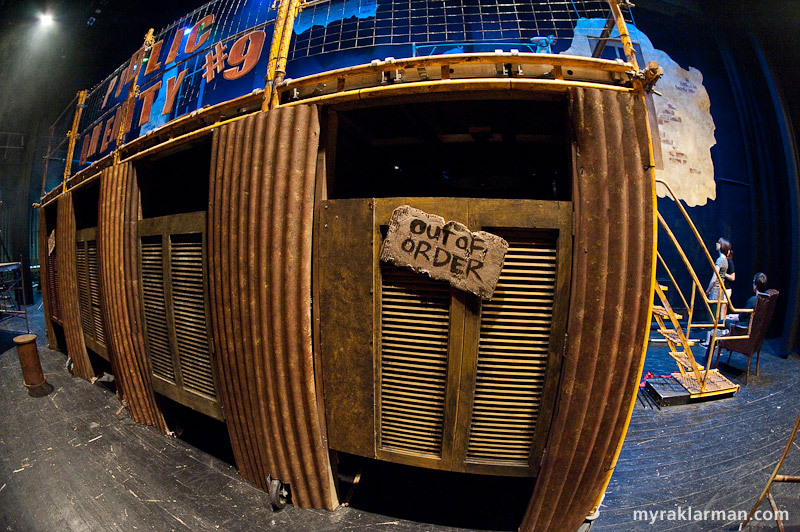 Updated May 6, 2009: I’ve added five NEW PHOTOS to this entry — several of which were intentionally held back until the end of the show’s run. Before the dress rehearsal: Public Amenity #9 (à-la-fisheye). Could this have been painted any more beautifully — “beautifully” in the sense of dilapidated, grungy, unhygienic, public-toilet-from-hell? This Brooklyn-born peon was — yet again! — bowled over by the great talent on display at Schreiber Auditorium this afternoon. 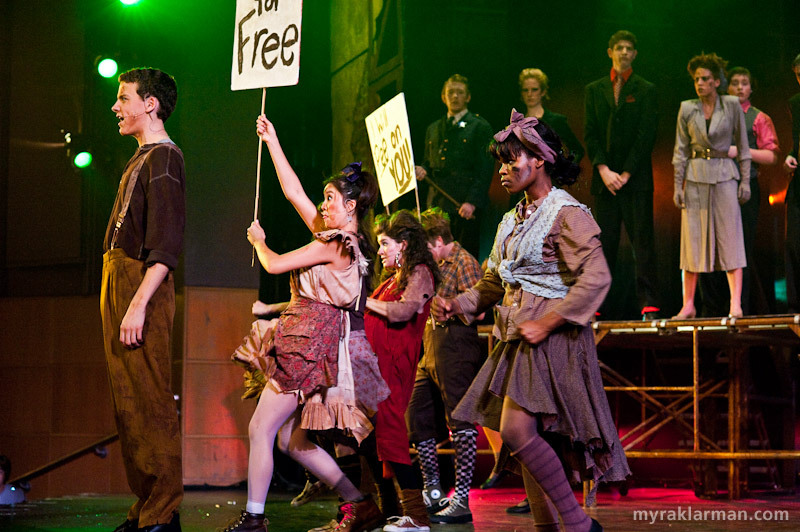 The members of the Pioneer Theatre Guild were full of piss and vinegar as they brought this fictional dystopia (Urinetown) to life on the stage. 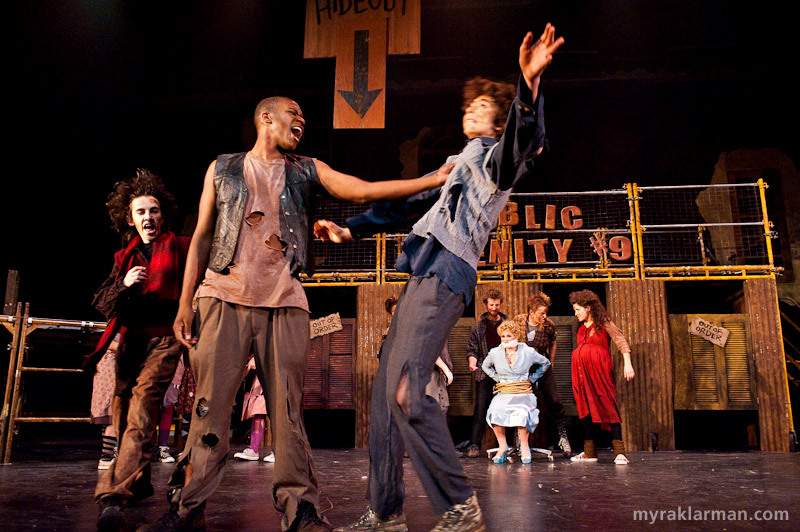 The show gives the cast many opportunities to demonstrate their musical theatre chops, while simultaneously mocking every convention of the genre — Rico thought it was pretty hilarious; and Max especially liked the “tinkle” sound effect, which the audio guys let him trigger during the intermission. 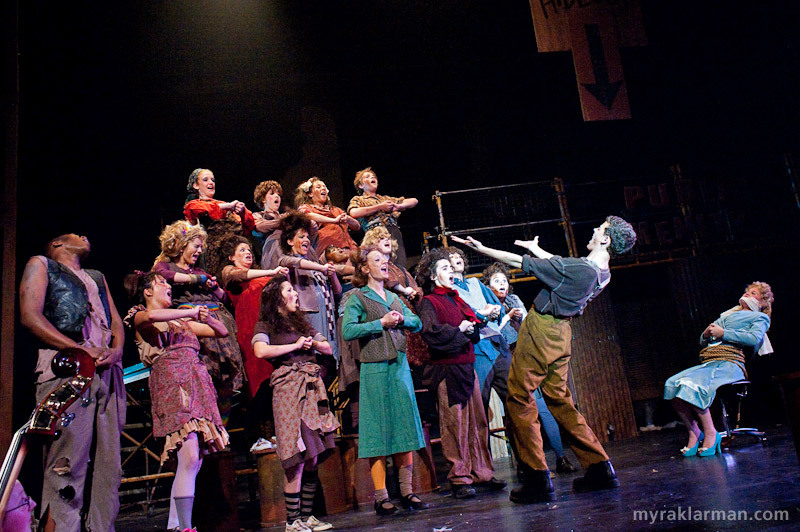 The production designers and technical crews make the cast truly shine with pitch-perfect sets, lighting, sound, costumes, make-up, and props. The production is tight, and utterly stunning. Kudos to stage managers Avi Dobrusin and Miriam Michaels for being the glue that holds it all together. 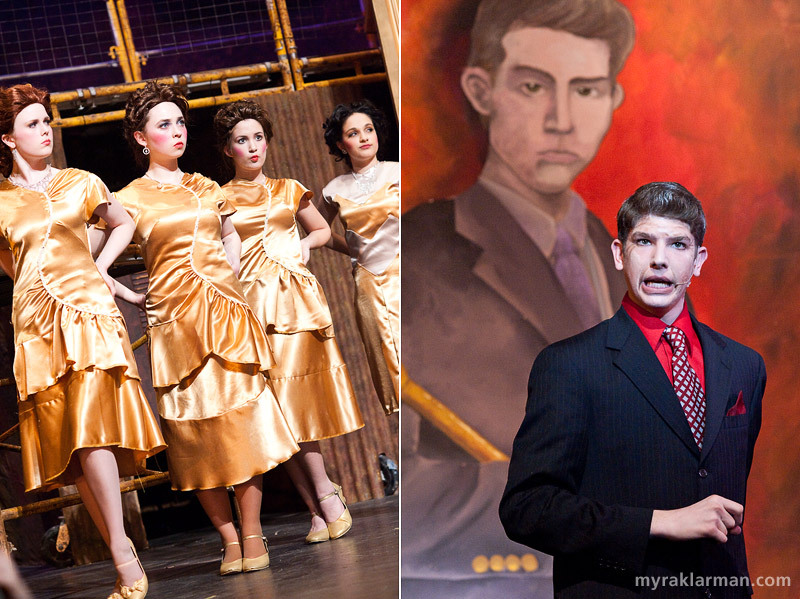 I shot these photos during the last dress rehearsal. When I originally posted this entry, I withheld a few choice images, as there are some wonderful surprises I didn’t want to spoil. 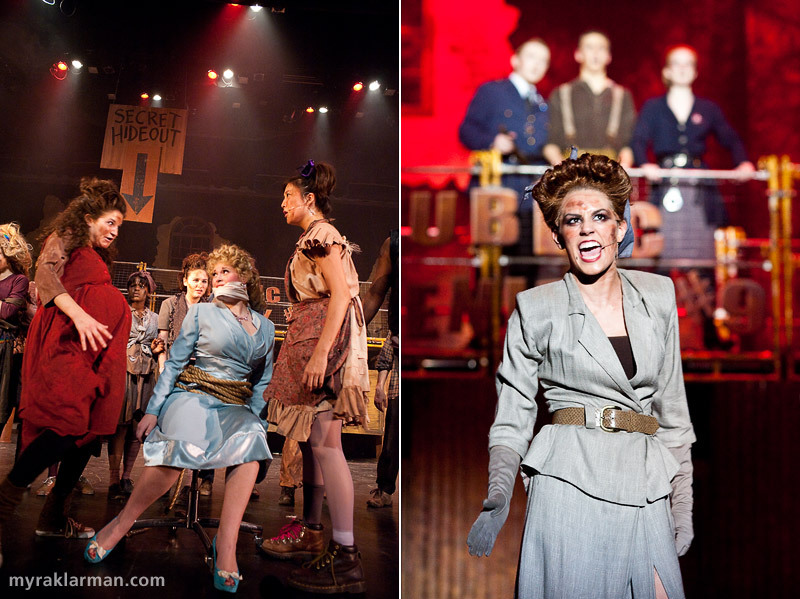 Only three performances remain. If you’re able to go, urine for a treat! All performances will be in Schreiber Auditorium at Ann Arbor’s Pioneer High School. More info is available at the Pioneer Theatre Guild website. 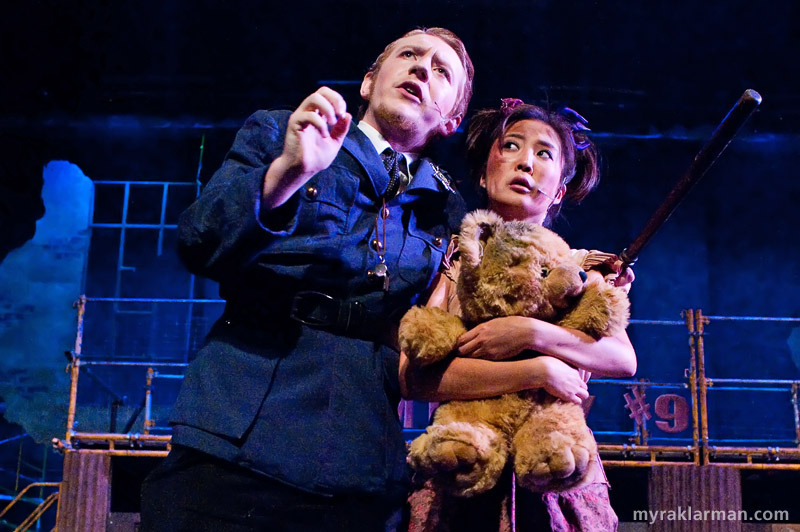 Urinetown narrators, Officer Lockstock (Rory Scott) and Little Sally (Ashley Park), consider various problems that might ruin a musical — e.g., a bad title. 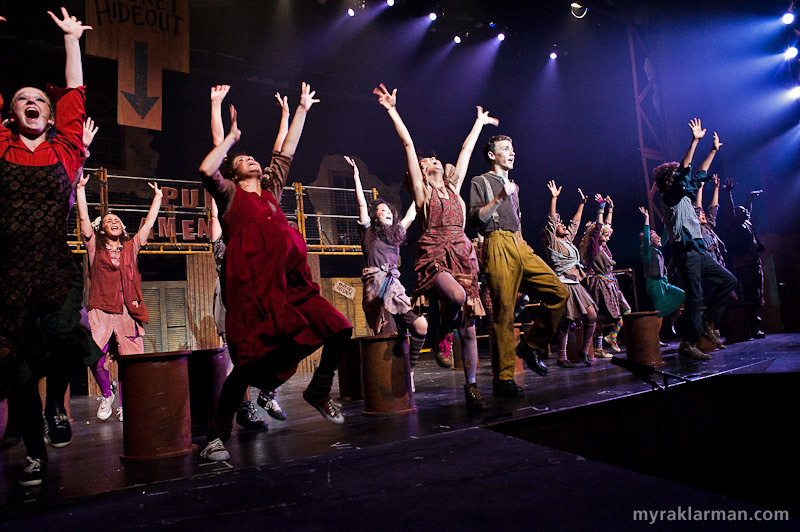 The impoverished denizens of Urinetown perform the title number. 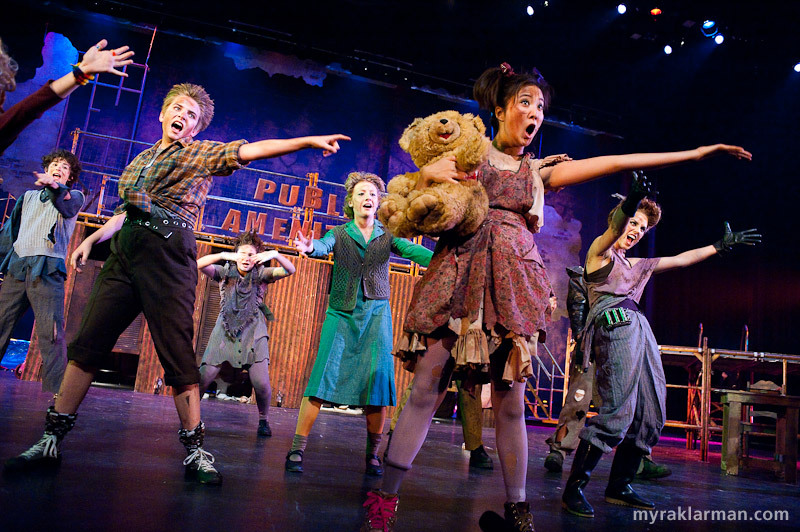 Both times I saw the show (shooting the dress rehearsal, and in the audience with Max and Rico at the first matinee), I was amazed with the energy of the performances — these kids don’t hold anything back. I must have those socks! | Little Sally’s teddy-bear bank, in which she keeps her “pee” money (the bear features a twist-off head). The office of Caldwell B. Cladwell, the money-grubbing, cold-hearted, Hobbesian president and owner of Urine Good Company (UGC on the NASDAQ). Cladwell’s portrait was expertly painted by Raye Evrard and Elayne Fivenson, with David Zinn. 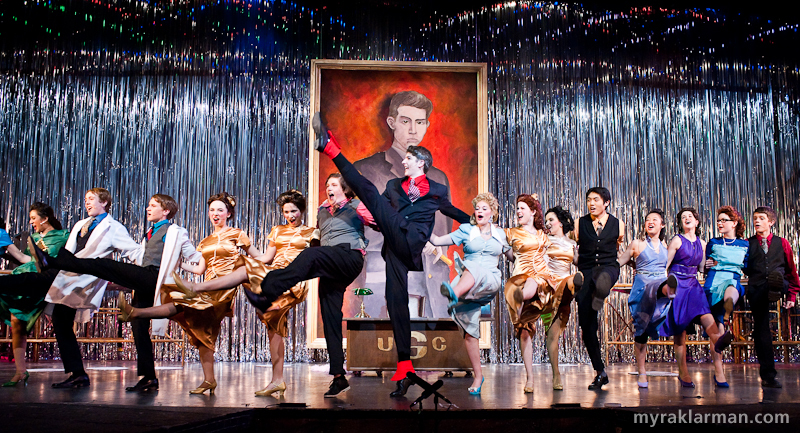 Some of the well-heeled staff at Urine Good Company. | Caldwell B. Cladwell (Robert Axelrod) is a deliciously despicable villain. NEW PHOTO: Three rather large — albeit cute — bunnies (James Driessche, John Lee, and Joe Weindorf) meet unhappy endings in Don’t Be the Bunny. 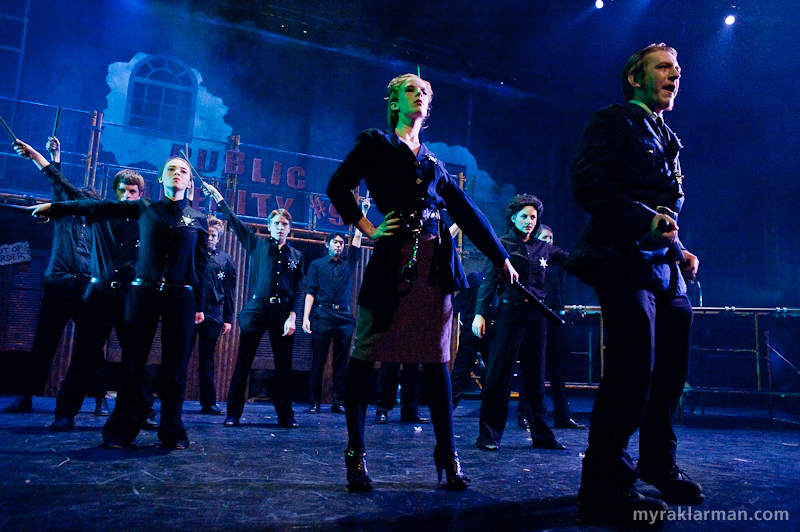 Act 1 Finale brings the entire cast onto the stage. The “Pee for Free” revolutionaries throw off the shackles of economic oppression, while the forces of darkness — or so it would seem — look on from above. Old Man Strong (right): Bobby! Bobby, reason with the woman. I’m a little short this morning. Tiny Tom (left, tossing silver glitter): No shorter than yesterday. Unless I’ve grown. 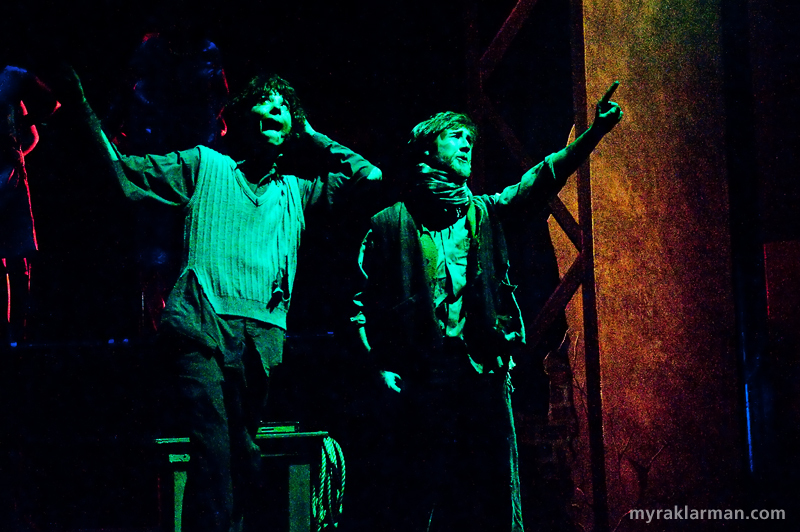 Hot Blades Harry (John Spalding), center, shows Tiny Tom (Russel Norris) the meaning of “Urinetown” in What is Urinetown? I love the enormous sign (partially visible in the photo) that reads “Secret Hideout” — and even features a helpful arrow showing just where it is. This is typical of the self-referential (and in this instance, self-negating) humor of the show. 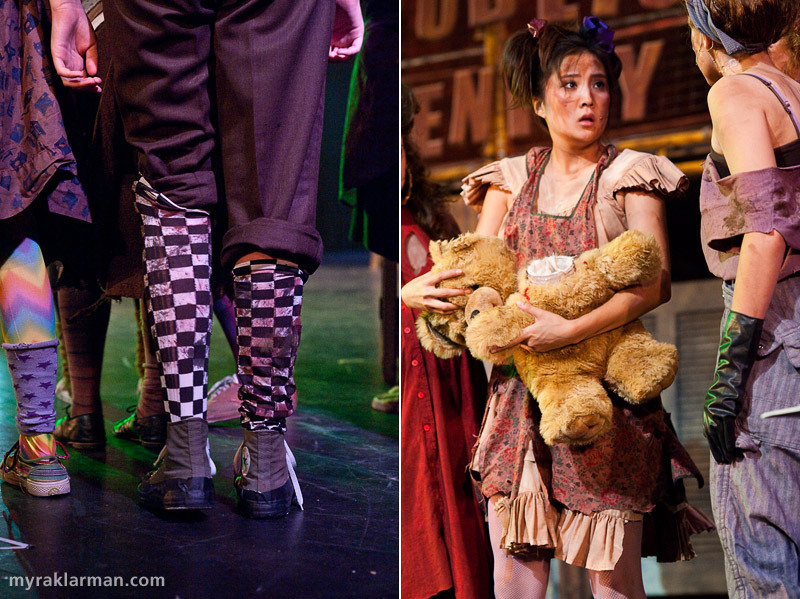 Little Becky Two Shoes (Maia Gleason) and Little Sally (Ashley Park) debate Hope Cladwell’s (Mara Abramson) fate. 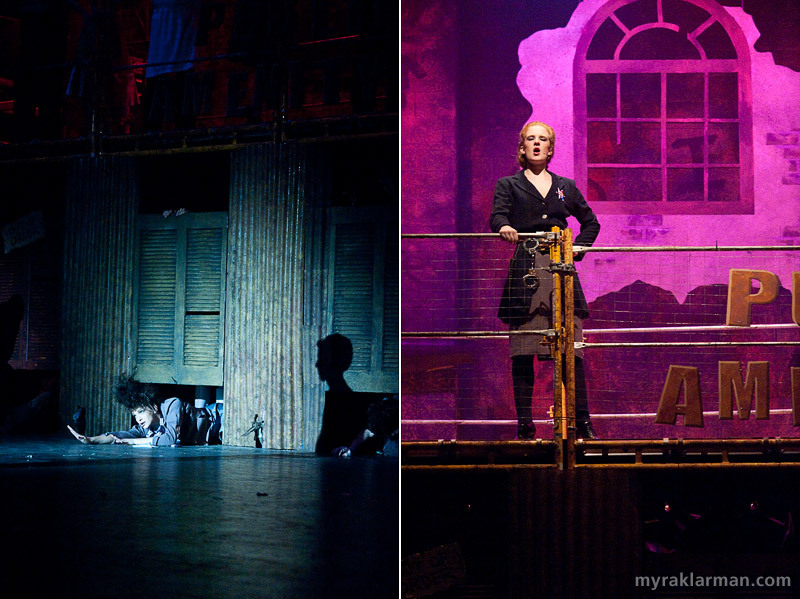 | Penelope Pennywise (Emily Steward) laments, Why Did I Listen to That Man? Bobby Strong (Robby Eisentrout) leads a paupers’ choir in one of my favorite numbers, Run Freedom Run. Bottoming out at Public Amenity #9 (Carly Paull-Baird). 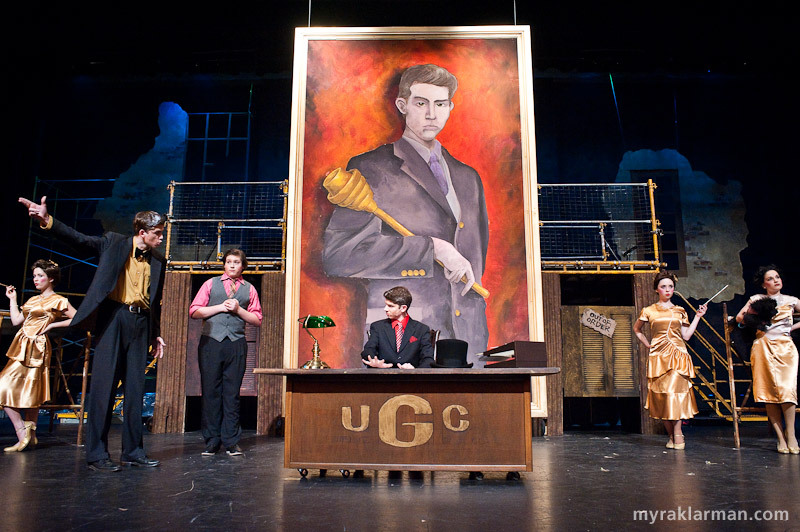 | Officer Barrel (Olivia Songer) high on the roof of Urine Good Company. 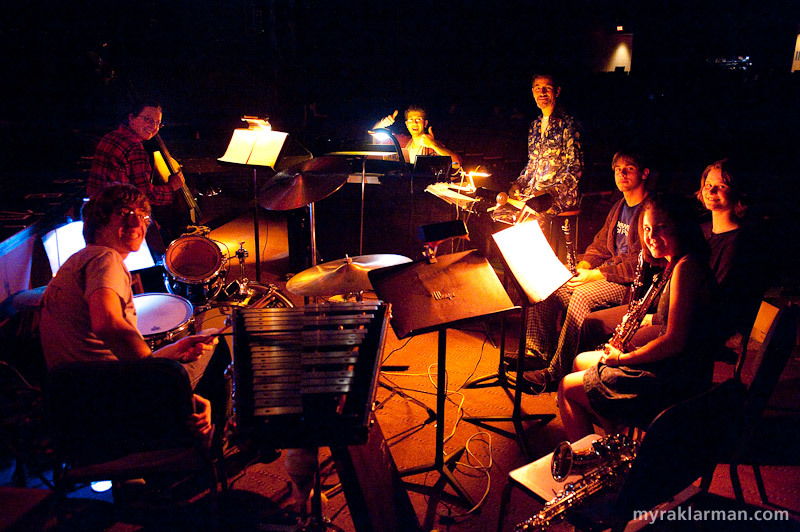 The Pit, clockwise from bottom left: Ryan Yunck, Gillian Golden, Tim VanRiper, David Perample (conductor), Andrew Koeppe, Jennifer Woolley, Hope Wilson (not shown), Julia Markey, and Dan Siler (not shown). They were singing and dancing like there was no tomorrow. I was rocking out in my seat, hoping it would never end. These photos are extraordinary. Thank you for capturing the work of our cast and crew with such breathtaking color, clarity and beauty! Myra, The photos are wonderful. The vivid color conveys the atmosphere. I can almost smell the stench! As always, I’d like to see the crew in the photos: make-up, costumes, sets, and sound . The actors would’t look or sound as good as they do without the backstage help. Too bad it’s the same faces all the time!